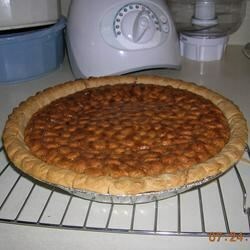 "This is a delicious alternative to pecan pie." In a mixing bowl, blend together the eggs, peanut butter, sugar, light and dark corn syrup, butter and vanilla. Fold in peanuts and pour into pie crust. Bake 30 to 35 minutes or until set. Remove from oven and cool; serve with ice cream or whipped cream if desired. Wow! Turned out perfectly! I only had unsalted nuts on hand, but threw 1/4+ tsp. salt in to compensate. It's great! This is a delicious pie. My husband compared the taste to that of a Payday(tm) candybar.